View PST and OST files in a few clicks without Microsoft Outlook. Open PST and OST orphaned Outlook data files. Search and export Contacts, Calendar, and email folders content to PST and other file formats. OST files are used in Microsoft Exchange Server to store data on a local computer, hence you can’t connect it directly to Outlook. With OST PST viewer, you can open OST files in a few clicks. The software is designed with familiar Microsoft Outlook look-alike user interface. So, you can manage and interact with PST files content the way you usually do, e.g. view or reply to a message, view monthly calendar events, search and copy a selected contact phone number. 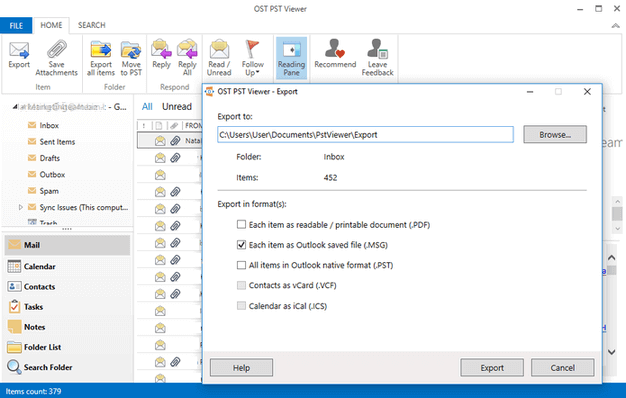 With OST PST Viewer PRO Edition* you can manage Outlook data file content beyond just viewing it, e.g. export PST files convert OST to PST file to various file formats, export one or all attachments from the selected folder, change or update the follow- up flags and read/unread status, advanced search and more. All above make OST PST Viewer Pro an indispensable tool for professionals, who manage Microsoft Outlook and Exchange mailbox backups , PST archives, for export and mailbox data migration and OST file conversion , as well as for regular users of Microsoft Outlook desktop software who need access to Outlook data and backup without opening it, or if Outlook fails to start or lost connection to an Exchange server. You can open and read .ost and .pst files of any size created by any version of Microsoft Outlook. OST PST Viewer is Windows standalone software, which operates even without Microsoft Outlook installed. You don’t need to spend extra time for becoming familiar with the interface. When you open Outlook data file in OST PST Viewer everything will be in its proper place. The PST Viewer tool enables you to view the content of healthy, damaged or corrupted PST or OST files, as well as extract data from them without using Microsoft Outlook desktop software or in case you do not have it installed. The software provides a quick access to offline data when Outlook becomes unresponsive or fails to open. Quick Search helps you to quickly find the message or items in Outlook OST or PST files. The Quick Search pane is similar to Outlook’s Instant search and is always available in all of your OST PST Viewer views, such as Mail, Calendar, Notes, Tasks and Contacts. *Some product features are still under development or you can request them as part of a customization quote. OST2 for Microsoft Outlook Convert OST to PST files and connect converted files to Microsoft Outlook. Safe PST Backup for Microsoft Outlook Personal Backup Outlook software. Backup Exchange folders and PST files. Back up Email, Contacts, Calendars or other folders. Create Microsoft Outlook PST backup email archive automatically. Sync2 Sync Outlook between multiple PCs. Sync Outlook with Google Calendar and Gmail Contacts.